Struggling with vision up close, far away or in between? 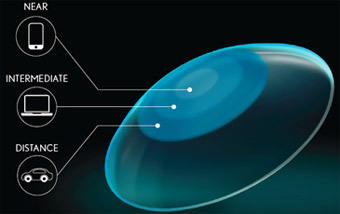 Bausch + Lomb Ultra for Presbyopia contact lenses offer exceptional comfort and outstanding vision in a multifocal lens. Because you are constantly changing where you are looking, whether reading, working on a computer, or driving, it is important that your multifocal lenses keep up. 3-Zone Progressive Design gives you clear vision up close, far away, and in between. MoistureSeal technology helps provide you with all-day comfort. 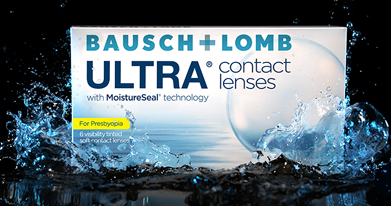 Bausch + Lomb ULTRA for Presbyopia contact lenses maintain 95% of their moisture for a full 16 hours. With Bausch + Lomb's 3-zone Progressive multifocal design, ULTRA for Presbyopia is ideal for computer users.